In our most recent blog post, we looked at several kitchen remodel ideas for the holiday season. Perhaps one caught your eye and now you’re getting antsy to start the project. There’s just one problem — you have no idea which contractor is right for the job. This is an essential first step toward finding that ideal contractor. Today, every kitchen remodeler should have a website that clearly expresses their specialty areas and how long they’ve been in the industry. If their site is jumbled or looks as though it hasn’t been updated since the 90s, eliminate that contractor from your list of candidates. Maybe you have friends, family members, or coworkers who recently had some work done in their kitchen. Ask around and see if any of them would recommend the contractor they hired. Just make a note to research word-of-mouth referrals yourself. It’s time to start getting picky in your search. As with other home improvement projects, you probably don’t want to hire someone with minimal experience. 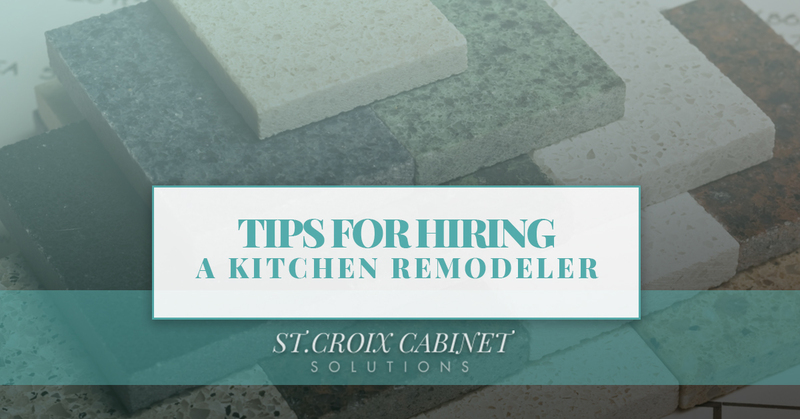 There’s no question that hiring a remodeler who has been there and done that will put your mind at ease from the beginning. This is just as important as experience or maybe moreso. Check if the contractors who are still on your list have the necessary licenses, credentials, and insurance. Should they not, then play it safe and move on to the next option. Your list of potential candidates should be getting smaller at this point. Now’s the time to choose two or three and interview them personally. You should ask questions about their level of expertise as well as how they would approach your project specifically. You’ve found a contractor who not only does quality work, but also has the expertise and credentials to back it up. Before signing on the dotted line, be sure to check their references. Ideally, two of the references should be for the same type of project you want to be done. Is he or she at all hesitant to provide references? In this instance, a red flag should go up in your head and you should move on to the next contractor. The last thing you want is to get stuck with a less-than-stellar kitchen remodeler. We dedicated an entire post to how to save money on your kitchen remodel. Obviously, you want to upgrade this space without breaking the bank. But here’s a question you must ask yourself: Would you rather settle for low-quality work at a cheap price and then pay someone else to fix everything not long after or does it make more sense to hire the best from the beginning? You’ve finally selected a contractor and it’s time to get to work. How do you know the start and stop dates of the project, hours of working time, materials that will be used, and other important details? This is where a contract comes into play. Without some sort of binding documentation, your contractor is essentially off the hook for any delays or cost discrepancies. Have the contract reviewed by an attorney if you’re unsure about certain language. Did you know that the inspection process of your kitchen is in place to protect you from poor workmanship? With that in mind, double-check that the remodeler gets all the necessary permits ahead of time. This ensures that everything is built to code. We see stories all the time about homeowners who were tricked by dishonest “contractors.” Steer clear of remodelers who do door-to-door solicitation, want full payment prior to starting the work, or pressure you into making a decision. Here at St. Croix Cabinet Solutions, we make it easy to have the kitchen of your dreams. Our husband-and-wife team emphasizes honesty and integrity with every customer, regardless of the scope of the project. Plus, we have options for every budget. St. Croix Cabinet Solutions is Hudson’s choice for replacement cabinets, cabinet refacing, and kitchen countertops. Get your free estimate today.